The Threshold Alpha command converts semi-transparent areas of the active layer into completely transparent or completely opaque areas, based on a threshold you set, between 0 and 255. It only works on layers of RGB images which have an alpha channel. If the image is Grayscale or Indexed, or if the layer does not have an alpha channel, the menu entry is insensitive and grayed out. If the Keep transparency option is checked in the Layers dialog, the command displays an error message. You can access this command from the image menubar through Layer → Transparency → Threshold Alpha. 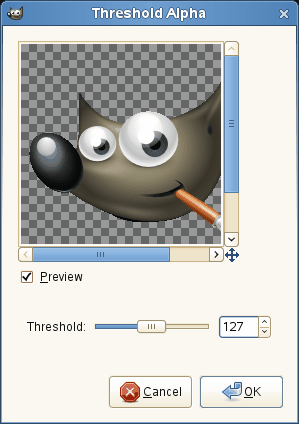 You can set the transparency value to be used as a threshold by using the slider or by entering a value between 0 and 255 in the input box. All transparency values above this threshold will become opaque and all transparency values below or equal to this threshold will become completely transparent. The transition is abrupt. 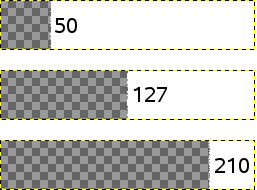 This command will never make completely transparent pixels (alpha value = 0) opaque. Threshold set to 50, 127, 210.